Giovanni found the lion, its claws clamped on some poor dead bird, a troubling omen of how this evening might close. Still, he was glad it was he who had to gaze on it. 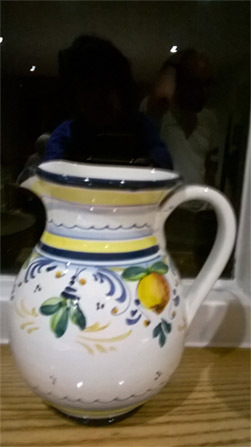 Mariana, seated opposite him, was blessed (he had noted as the waiter led them to their table – Giovanni checking all the while to left and right) by the Virgin and Child and a lemon-patterned jug on a shelf. It was a pity, he felt, that they had been placed in the restaurant’s basement. But there again, he conceded, he had asked for somewhere quiet and private. So far, things looked fairly promising. There were just five tables down here, and only one other was occupied – by a pair of silver-haired ladies who might have been English or German. They were unlikely to sully his enterprise. Two of the other tables were very large. One was very large indeed. From time to time he swivelled his eyes to the right to take a speculative glance. A sense of anticipation extended from its neatly installed chairs, each pushed forward neatly so that its seat was hidden. At one point, while Mariana was inspecting the menu, he tried counting the chairs – two rows, on either side of the table, with two at each end. Sixteen, eighteen… He gave up. But it was still only eight o’clock. Large parties, he reassured himself, have a habit of staying away until the evening draws late. Taking a gulp of his Perona, Giovanni contemplated the neat, composed young woman who, silvered eyelids in a modest droop, still contemplated the menu. Then he replaced his glass and explored the deepest reach of his trouser pocket with his index finger. There it nestled, awaiting its moment. He hoped Mariana would finish her Fanta and move promptly onto something stronger. Possibly she suspected his intentions – but those long dark lashes gave nothing away. Giovanni made another lunge at his beer. Giovanni beckoned to the unoccupied waiter, proud to be showing off to this beautiful woman his natural authority. Pad and pencil in hand, the waiter approached swiftly, like a black beetle. No, Mariana’s request for Fanta had not been a good sign. Having ordered the food and another Perona for himself, he asked for the wine list. He had ordered the branzino, so white would have been a suitable choice. But he was quite happy to accompany the fish with a nice red, if that’s what Mariana preferred with her pork. Or should he order a glass of each? Giovanni felt the beads of sweat begin to moisten his new shirt. He had never been confident around wine lists. Just as the beetle was pouring the rosé (what a delightful colour, what luminescence! As pink and pure as…), the occupants of one of the other tables arrived. These consisted of four girls, primped up for what would presumably open out into a dazzling night. Giovanni found it very hard to estimate the ages of young girls these days. His sister Lucia was, he knew, not typical. He was proud and protective of her modesty. For some reason, her diagnosis made Giovanni feel sad. But then he brightened up, remembering the task in hand. He raised his glass. Mariana raised hers. Her choice sent sparks of fizzy hope from shoulder to fingertip. He had to steady his right hand. They clinked glasses. Then a mobile phone on the girls’ table went off, its ring-tone some English pop song Giovanni only half recognised. The girl spoke loudly – but not for too long – into her mobile. She seemed to be finalising arrangements about meeting up at a club at eleven o’clock. Certainly, with the entry of this garrulous party, the decibel level had soared. The two silver-haired ladies conversed quietly and intermittently, thank goodness. Once again he explored his trouser pocket with his finger. Yes, enjoy the rosé and some fine food, and then leave this noisy cave for somewhere that fitted his purpose. It was a charming experience to share the plate of antipasta mista. As Mariana pincered bruschetta, fat green olives and thin slices of ham between her pink-dipped talons, Giovanni felt the sparks fizz once more, this time in a deeper place. She clearly enjoyed the whole experience of eating: choosing, picking, nibbling – and then that glorious moment when he watched her throat move as she swallowed each morsel. From time to time she would desist, looking up from the plate into his eyes; shooting him an encouraging smile. They were prettily-dressed children. Despite their intrusiveness, Giovanni found himself smiling – which was just as well, as he realised a moment later that Mariana was perusing his face for a reaction to them. She loved children, he knew. They had discussed the subject during that perfect picnic at the Boboli Gardens. It was an important consideration. Giovanni checked his watch: nearly 9 o’clock. Then he smiled once more. This was an Italian custom of which he felt particularly proud: entire families, having passed the afternoon in a siesta, arose as evening fell and undertook the passagadio, that strolling dinner-time ritual through the city streets. It was a good time for dog enthusiasts to stay alert: some splendid specimens might be spotted walking sedately alongside their owners. Mariana loved dogs as well. Raising his hand, he pressed thumb to finger in a gesture of approval. At a leisurely pace, they ate their food. For Giovanni, however, there was that urgency tugging at his sleeve which made it hard to let go. And he sensed that, like him, Mariana didn’t find the atmosphere as expected. Once more, the sweaty dewdrops started to slide down the inside of his shirt. Now that Family Loud was issuing its demands, the beetle had abandoned him. Again, Giovanni considered the mysterious etiquette of wine. He should let the waiter pour it, he felt certain. But then this was turning into a crisis: both glasses needed topping up. There was no time to lose. So he reached over into the middle of the table (almost singeing his cuff on a candle) and did the honours. ‘Try.’ He hadn’t intended his command to emerge so abruptly. It was just after 9.30pm that the party turned up to claim the long table. Of course! All was now clear. Why hadn’t he guessed? Again, he gave up counting. But there must have been about twenty men settling themselves along the table, like monks on special dispensation gathered at the refectory table, bristling in readiness to have a good time. They all wore the identical grey strip. They couldn’t be professionals, who would have chosen a much smarter venue. Giovanni wondered whether Mariana overheard the groan he uttered (probably not, in such a din). This special evening had been infested by woodlice – a kitted-out team of amateur footballers. He noticed the two elderly ladies were hurriedly paying their bill. Meanwhile, one of the sons in the family party was gawping at the footballers, his open mouth dribbling down the pitch of his chin. He probably thought they really were ACF Fiorentina. It was beers all round for the latest invaders. The two ladies picked up their handbags and left. The beetle was clearly finding it hard to cope. Why was no-one working with him down in this crowded basement? To get up and go would be doing him a kindness. She treated him to another smile, and dutifully took another sip of wine. In fact she had to take several sips before Giovanni was able to attract the waiter’s attention. Using hand signals, he performed the motion of someone writing in the air. The beetle finally catching on, he brought il conte. Rather than waste time sending him back to fetch a card machine, Giovanni tapped his wallet, secreted inside the jacket that hung from his chair, and knew instinctively that he had enough cash. His worries that Mariana might wish to use the ladies’ room proved groundless: it was she who led the way up the steps, he fixing his eyes on her buttocks, made yet more shapely, so it seemed to him, by her climbing action. It was hot upstairs, but the moment they stepped outside into the cool night air, Giovanni felt relaxed and emboldened once more. With a pitying eye he glanced at the queue of people waiting for a table Al Forno. She looked pleased. He put his arm around her, pressing his body against hers as they walked, sensing her large handbag knocking against her hips, inhaling her scent. Roses. Rosé. And so they strolled along the narrow cobbled streets until they reached the city’s famous bridge. Light sparkled on the black waters of the Arno. The jewellery shops were all boarded up. In one movement, they stepped up and leaned together over the bridge, contemplating the murky, light-flecked river. A faint whiff of sewage rose up to greet them. That was not what Giovanni needed. Reaching inside his pocket, he pulled out the tiny box. For an instant, he clasped her arm. Then he went down on one knee and pressed the talisman into her hand. ‘Open it,’ he said.